Before MySpace and Facebook, there was Friendster, a pioneering social networking website for consumers. First launched in 2002, Friendster attracted tens of millions of users over the years, but it never quite grew into the online juggernaut it could have been. Having raised close to $50 million in venture capital, Friendster was acquired by Malaysian payments company MOL Global at the end of 2009 for a reported $40 million. Fast forward to today, and it looks like Friendster won’t be so much about sharing with friends anymore. In a message to registered members (hat tip to @Mazi), the company is asking all users to install a custom application to export all their profile data, as most of it will be unequivocally deleted on May 31, 2011. 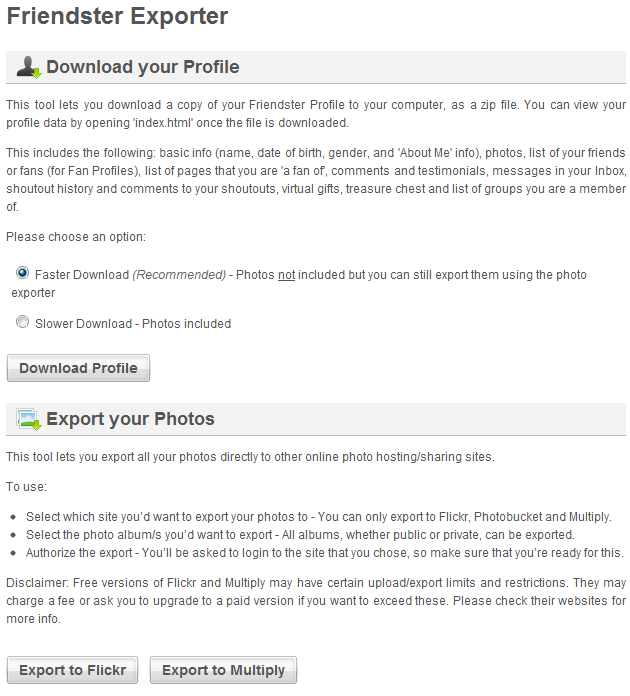 On the help forum, Friendster encourages all users to use the ‘Friendster Exporter’ app to download or export their profile information, friends list, photos, messages, comments, testimonials, shoutouts, blogs and groups. Options include porting content to Flickr or Multiply. On May 31, Friendster will move to wipe out all photos, blogs, comments and groups uploaded or created by its users. The company will, however, keep all accounts alive, along with user friends lists, games details and basic profile information. The new Friendster should be going live in the coming weeks and focus mainly on Asian users. Just last week, MOL Global / Friendster CEO Ganesh Kumar Bangah told ZDNet that he’s under the impression social media sites are increasingly being made irrelevant because the global social graph is increasingly dominated by Facebook. He added that, as a result, Friendster will be repositioned as a social entertainment site for people to play games and music, and that it will leverage Facebook Connect. Coincidentally, it’s been exactly a year since TechCrunch founder Michael Arrington wrote The Age Of Facebook, noting that the social network’s dominance had only just begun. I wouldn’t exactly call Friendster a casualty of Facebook’s steamroll, but clearly, Friendster the social network as we knew it will be no more by the end of next month.